In 2017, several famous forks of Bitcoin were launched including Bitcoin Cash and Bitcoin Gold. More than $44 billion of market value was created via forks last year. This trend will most likely continue during 2018 because forking an existing cryptocurrency is an easy way to create a new cryptocurrency. First, ICOs are illegal in several countries; however, hard forks are not. Second, forking an existing coin automatically gives the new coin a network of users: everyone who held the old coin now has access to the new coin. This eliminates the obstacle of building a network of users from scratch. Finally, forking an old coin can have lower development and marketing costs compared to creating a completely new coin. A “fork” in the context of software development describes the creation of a branch of a program that represents a different version. The concept itself is nothing new in the world of software, as it has been around since the 1980s. The first documented fork was MIT’s Lisp Machine OS in 1981. In open-source projects, anyone is allowed to “fork off” a version of existing code. 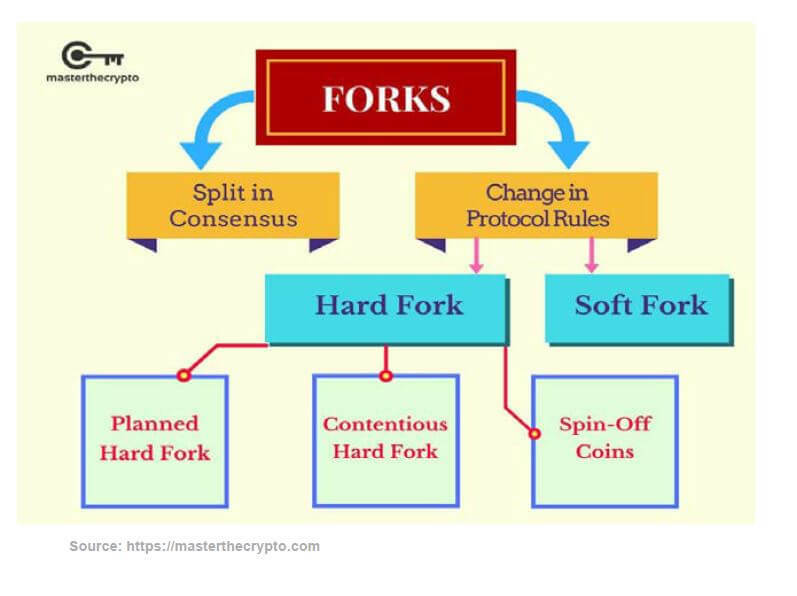 Forks are used when no clear agreement could be established in a developer community, and consequently, community members split off and create altered software code. So why have forks become such a big deal in the world of cryptocurrency lately? Given the high interest in speculation of blockchain protocols such as Bitcoin, a fork has quickly become much more than just a technical term, as it also has huge financial implication for investors and speculators in cryptocurrencies. Before we assess these implications, let’s take a brief look at what types of forks can be distinguished. What Types of Forks are There? Unplanned forks, or consensus splits, occur every time two miners find new blocks at the same time. However, this type of fork is not permanent because the longest chain rule resolves the discrepancy automatically. As soon as the next block gets mined, the longest chain represents the valid one and the other chain is abandoned. Thus, this type of fork does not impact cryptocurrency prices. Planned forks activate at a certain block time and are usually announced by the developers of a blockchain protocol. This type of fork only happens if developers intentionally change the code to update the rules of a protocol. Here, two types of protocol upgrades can be distinguished. A soft fork is a voluntary way to upgrade a software where participants who do not upgrade merely risk out on missing new functionalities. This type of fork is considered to be “forward-compatible” from the viewpoint of existing nodes. In the case of a blockchain soft fork, this means that old nodes will still recognize the new blocks as valid after the update. Thus, old nodes can in principle still use the same blockchain without performing the upgrade. Note that if a soft fork is coordinated by miners, it’s called a “miner-activated soft fork” (MASF), whereas if a soft fork is coordinated by owners of full nodes without the support of miners, it is called a “user-activated soft fork” (USAF). A prominent example of a soft fork is BIP141, better known as Segregated Witness, which was activated in August 2017 when the majority of miners switched to the new version of the Bitcoin protocol. As can be expected for a soft fork, due to backwards-compatibility transfers between new “Segwit” addresses and old addresses are possible. i.) In the case that some nodes do not update and enough support for old chain remains, two competing blockchains result. A well-known example of a hard fork where the old chain remains to be supported to this day is Ethereum, which was hard forked in 2016 after the leading developers of the Ethereum protocol decided to alter the code in an emergency response to the successful attack on “the DAO”. The members of the community who ran full nodes and opposed the hard fork refused to upgrade their nodes. Thus, the old chain still exists to this day under the name Ethereum Classic. ii) Most of the time, however, all participants support the new chain and move along with upgrading their nodes. In this case, the old chain simply dies off. A recent example is the Ethereum Byzantium hard fork in late 2017, which went through smoothly without any complications and the old Ethereum chain simply ceased to exist. Aside from forks originated for the purpose of upgrading a blockchain protocol to improve it, the open-source nature of many protocols allows any developer to clone it, add a few new features and release it under a new name. Some well-known examples of spin-off coins based on the Bitcoin codebase are Litecoin, Peercoin, Namecoin and Dogecoin. In 2017 alone, 19 Bitcoin forks were released in total. In many cases, these forks are used as a quick way to capitalize on the public’s familiarity with Bitcoin. In 2017, more capital flowed into new cryptocurrency forks than ICOs. There even exists a website promoting the automated generation of a Bitcoin fork. Thus, some people speculate that more Bitcoin forks will be seen in 2018. What Implications Do Forks Have For Cryptocurrency Investors? 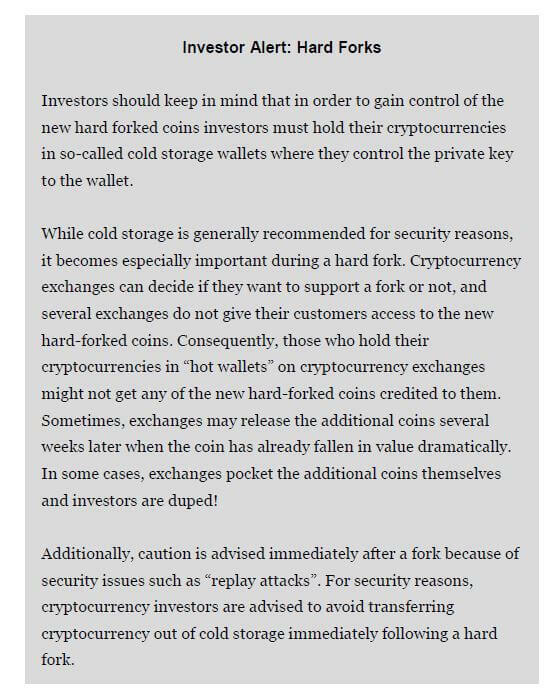 Forks do not only have technical implications but also affect the price of a cryptocurrency being forked in multiple ways. While unplanned forks (consensus splits) usually do not impact the price at all and the price impact of soft forks is usually limited, it is hard forks that result in two competing blockchains that are most relevant for investors. When a coin is hard-forked, the holders of the original cryptocurrency are automatically entitled to the coins on the new blockchain. This occurs because the private keys that control an address on the original blockchain also control an address on the new forked blockchain. Hence, investors have exposure to the original cryptocurrency and the new hard forked cryptocurrency, which presents an opportunity to profit from the fork. The value of the new coin that results from the fork can be sold. Market participants discount the future value of this coin and bid up the price of the original coin before the fork happens. As the strategy of buying a cryptocurrency before a fork and selling the new coins after the fork spreads, prices will rise even earlier, as traders try to buy the original coin before others. As a result, the price of a cryptocurrency usually rises before a fork takes place and drops once the fork has occurred. 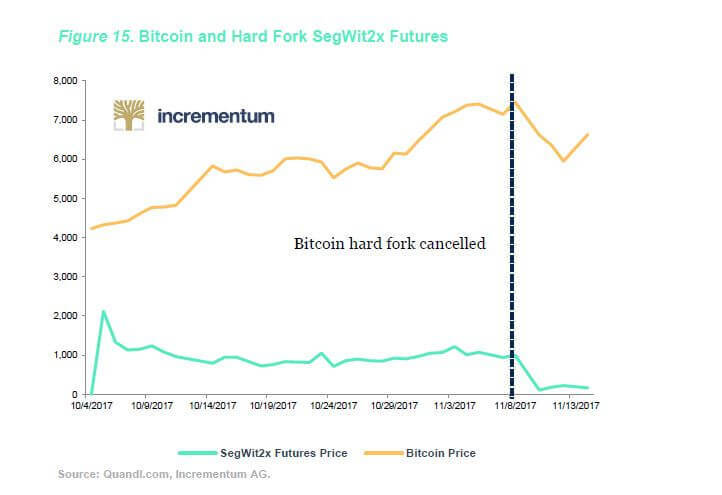 If the hard fork is cancelled, the price of the original chain drops because the discounted future value of the hard-forked coin is zero (see Figure 15). While forks are a long-standing way to upgrade software protocols without forcing everyone to participate in the upgrade, there are real risks and opportunities for investors. On the plus side, the possibility of forks keeps development teams in check and might prevent rash, hasted decisions. Additionally, forks represent a possibility to create new coins in jurisdictions where ICOs are banned by law, such as China. On the negative side, a large number of spin-off coins may dilute the initial idea of a protocol and split the joint efforts of the community further. One thing is for sure: we are going to see more forks in 2018. Blockchain Research Institute, tweet on Twitter, Feb 10, 2018, https://mobile.twitter.com/GeniaMiinko/status/962393176769167362. “MIT Lisp Machine License Signed,” press release, Oct 1, 1980, http://www.textfiles.com/bitsavers/pdf/symbolics/LM2/MIT_Lisp_Machine_License_Signed_Press_Release_Oct1980.pdf. Olga Kharif, “Bitcoin May Split 50 Times in 2018 as Forking Craze Mounts,” Bloomberg, Jan 23, 2018, https://www.bloomberg.com/news/articles/2018-01-23/bitcoin-may-split-50-times-in-2018-as-forking-craze-accelerates.